One cent coins, or pennies as they are commonly called, have been made in the United States since 1793. Until 1857, cents were almost as large as our present day half dollar. 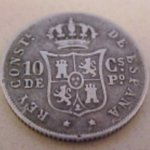 They have been minted in their present size since 1857 though an experimental or pattern example dated 1856 does exist and is quite valuable. There have been only three basic design types of small cents. The Flying Eagle cent was the first small cent and portrays an Eagle in flight on the dated side and a wreath of corn, wheat, cotton and tobacco on the reverse. 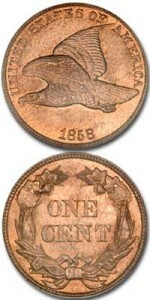 In 1859 the cent was redesigned to portray an Indian princess. 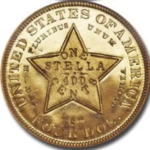 This popular design continued until the year 1909 when the cent was changed again to commemorate the 100th anniversary of Abraham Lincoln’s birth. From 1909 to the present, the Lincoln cent has had only one major design change. 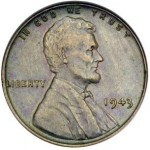 In 1959 the reverse was changed from ears of wheat to a representation of the Lincoln Memorial. 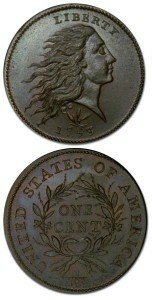 All Flying Eagle and Indian Head cents were made in Philadelphia with two exceptions. In 1908 and 1909 Indian Head cents were also made in San Francisco and an “S” mintmark can be found on the reverse under the wreath. On the Lincoln Cent the mintmark is located right under the date. Flying Eagle cents in average condition are generally worth about $15 to $20 except the very rare 1856 that is worth about $4,500. Unfortunately, many 1858 coins have been altered to look like a 1856. Beware of counterfeits! In the Indian Head cent series, the rarest dates are the 1877, worth about $600, the 1908-S worth $45 and the 1909-S valued at $400. 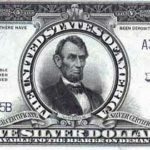 Most of the dates before 1873 (with the exception of the 1865) are worth at least $25. The most common dates are between 1880 and 1908 and are worth about 75 cents. The Lincoln cent series contains several valuable dates. The 1909-S with the initials VDB on the reverse is the most famous and is worth about $550. Other major dates are the 1914-D, worth $150 and the 1922 without mint mark, worth $400. 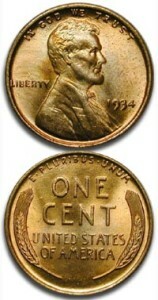 Typically, Lincolns before 1933 are worth 10 cents to $5 and those dated after 1933 are worth only one cent. 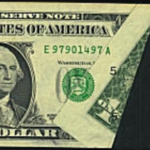 Several modern error cents exist such as the 1955 Doubled Die that has a doubled image and is worth about $700, the 1972 Doubled Die, valued at $150, the 1983 doubled die reverse, worth about $150, the 1984 with Lincoln’s ear doubled, valued at $100, and the 1995 doubled die obverse, worth about $25. Is my thick penny a Mint mistake?